The dots and squares represent flood gages in areas where rivers are expected to reach or exceed flood stages. Areas without gages are where little or no flooding is forecast. Red is moderate flooding. Purple is major flooding. 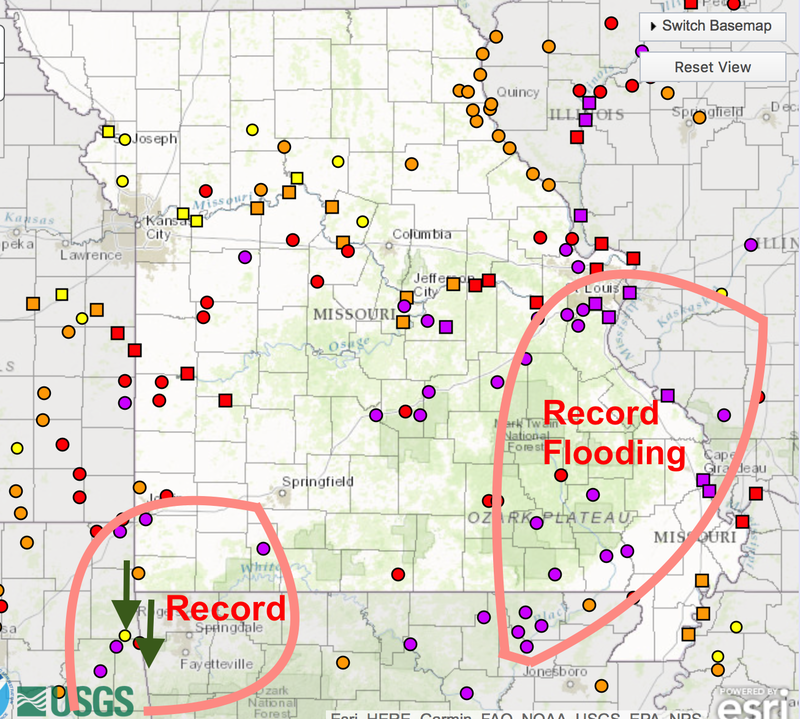 There are two areas where record flooding are occurring. The green arrows pointing down is where rivers have crested. In southeast Missouri, some rivers are cresting more then ten feet above the record flood stage. In south St. Louis, Interstate 44 will be closed tomorrow due to the Meramec River reaching its all-time record stage which was set in December, 2015. In eastern Oklahoma, the Illinois River will flood the town of Talequah as it will reach a record stage.